You have a Vata type constitution. This means that your dominant dosha is vata, which comprises of air and space. You have a light and creative disposition, with high levels of enthusiasm. With your adventurous nature, you hate stagnation and are always up for change in everyday life. You are also easily adaptable and can adjust to changing situations and relationships without much trouble. Much to the envy of your friends, you actually struggle to gain weight and your skin tans easily. While you have your slender frame and gorgeous tan going for you, you are frequently plagued with dry skin conditions like cracking and eczema. Nothing catches your fancy more than a spontaneous vacation or getaway! When it comes to travel and residence though, you have a strong preference for warmer and sunnier climates. This is most likely because of your dosha balance, which makes you predisposed to circulatory disorders. Unfortunately, the traits that give you your well-rounded personality can also give rise to problems making you easily distracted at times and leaving you vulnerable to frequent indigestion. 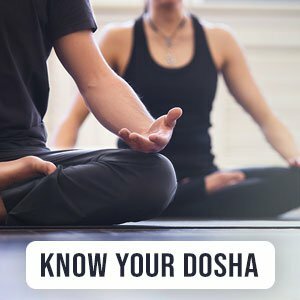 When your doshas are imbalanced, you could be more vulnerable to anxiety disorders, sleep problems, and joint disease, among other conditions.